I have watched this community since they broke ground!! My house was nearby and knew when I sold it this is where I wanted to live!! Love the community feeling, great office staff, maintenance is excellent, events, everything you want!! I’ve lived in a number of apartments in my life and have always loved Hankins properties!! Great service and upkeep all which seems to be a standard for there reputation!! The Hankin name made my decision an easy one. If this community is on your list don’t think twice!! Thank you so much for the positive feedback! We are so happy to hear you've enjoyed your experience at Claremont. Thank you for being a part of our community! Claremont is such a fantastic place to live. It’s well maintained, great surroundings, excellent location to major highways, extremely quiet, the staff is extremely friendly and helpful, and renewing my lease for the third time. Love it here! Hi Katherine, Thanks so much for your positive review! We appreciate the feedback and are glad to have you as a resident of our great community for another lease term. Warmest Regards! When relocating to the Exton area, I toured many apartment type living spaces. I wanted know what all the options and find what best suited my needs. After walking thru the apartments at Claremont I knew I was home! The layout was well thought out and every room was filled with sunlight! It was perfect!! I was thrilled with the amenities and meticulously kept grounds...I could not sign my lease soon enough . When I walked in on move in day, I was so pleasantly surprised at how clean my new home was! There was not a spec of dust or a streaked window. The carpet was immaculate ... it literally was the epitome of move in ready! I cannot say enough about the staff...they are super friendly and made me feel at home immediately. The office staff was so welcoming ~ because I dont know the area, I have asked for recommendations from anything from where to get a mani pedi, to car maintenance and best sushi (shout out to Blue Fin!). When my freezer had a malfunction. they were there within hours to solve the problem. Completely impressed by the team at Claremont! I really feel as though I have won the lottery ~ love where I live!!! Hi Lauri, Thank you so much for the positive feedback. We are so glad to hear about your experience at Claremont. Thanks for being a part of our great community! Cheers! We both would like to compliment the snow removal crews at Claremont for the last two storms, as the many other storms which we have endured. The endurance that was shown was exemplary. As a retired property manager I am well aware of the work that is involved with snow removal. Claremont's management and maintenance has done its job above and beyond. We are proud to be residents here and would gladly recommend Claremont to all. Just a heads up to your maintenance staff...they are the best...being a retired property manager, I know of what I speak! They are prompt, courteous and always try to remedy all of our concerns, even when it is a request as vague as a "rattling when the heat comes on". They found the source of the problem and solved it with a smile. Kudos to them! It was two years ago on Halloween when we moved into our Claremont apartment. We had waited some time to get the apartment we needed, with the right timing of leaving one lease and starting another. The pleasant staff showed us the unit and had the documents ready in no time. Living in Eagleview is like living in a mini-resort. This is a walking community with miles of trails and walks. At Claremont, we have two pools, which our grandchildren love. There are two lounges in the office building and I see mahjong players using the new tables by the fireplace. Tennis, basketball, vollyball , baseball and soccer fields are a short walk. We have live music outdoors every Tuesday in the summer and several movies as well. There is a weekly farmer's market. In terms of value, Claremont and Eagleview are unsurpassed. But there is more than just value in living in this community. The atmosphere created by the staff makes business easy. Our six year old grandaughter especially loves Sam in the office. Sam was her pre-school teacher and she always looks to see if Sam's Jeep is there and wants to stop. The maintenance staff is great; helpful and quick to respond. Our apartment is ideal for us; modern, convenient and roomy. We look forward to many more years of enjoyment here in Claremont. My experience living in Eagleview the past few months has been fantastic. It is an amazing community with gorgeous views, incredible amenities, and it is a quiet neighborhood nestled in a great location. I love it here and I highly recommend the community!! 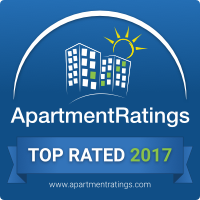 Claremont is an ApartmentRatings.com 2017 Top Rated award winner! This annual award recognizes properties with outstanding resident satisfaction ratings as measured on ApartmentRatings.com at the end of 2017. That is a a huge accomplishment as only 5% of the total properties listed on the website qualify for consideration! 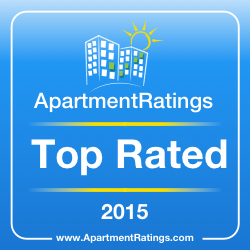 Thank you to all of our residents who have voted us Top Rated since 2013!